Call Me by Your Name is an Academy Award winning movie that stars Armie Hammer as Oliver and Timothée Chalamet as Elio. The movie takes place somewhere in Northern Italy in the 1980s. It is a coming of age movie that depicts the bittersweet moment of first love and first heartbreak. 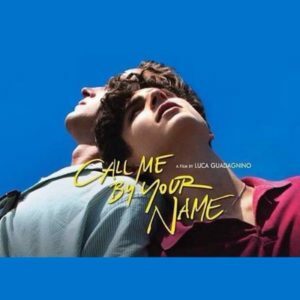 The movie was nominated for Best Picture, Best Song for Mystery of Love by Sufjan Stevens, Best Actor for Timothée Chalamet and Best Adapted Screenplay for Academy Awards and several other distinctions in other award ceremonies. The movie is based on a novel about André Aciman. The movie proceeds to build their love story slowly and then all at once much like love. There is careful flirting and mixed signals including both Elio and Oliver dating and sleeping with other women. The movie carefully tiptoes around their love, similar to the way they do only allowing the audience to see how infatuated and enamored Elio is with Oliver. Luca Guadagnino reminds the audience through Elio how confusing one’s first experience with love can be. These moments where Elio struggles with his love are beautifully underscored by the soundtrack which has three Sufjan Stevens songs on it. The soundtrack uses a lot of music from the 80s keeping the ambiguous time frame in check. Stevens is an important addition to the soundtrack because he is an openly gay man who struggles with sexual identity and faith in Christianity. Elio and Oliver both are hesitant with their love because of the stigma around being gay in the 80s. Elio and Oliver fear what Elio’s parents will think, what Mafalda, Elio’s maid, will think, what people will think if they found out that Elio and Oliver had a deeper love than just friendship. The movie’s poignancy comes from their struggle with their identities and acceptance of their feelings. The story, however, is incredible because it does not force labels. At no point does the movie for Elio and Oliver to label themselves as gay, or bi or straight. Both Oliver and Elio have relationships with men and women. There is an openly gay couple that Elio’s parents welcome with open arms for dinner. The story focuses on love and the confusion of love rather than the mess of creating labels. The movie chooses to focus on the visceral rather than identification. The movie is so beautiful for this reason, it is a movie about fiery, unforgiving, unrelenting love, not just figuring out who one is.